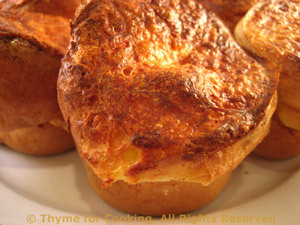 Popovers, with Cheese, Thyme for Cooking quick, easy breads. Recipe in: Breads, Desserts, Misc. Popovers are so easy, and so good hot from the oven, slathered in some sweet butter, of course. The secret is simple: whisk the eggs, then lightly whisk in the milk and flour; a few lumps are okay, you don't want to deflate the eggs. Butter muffin pan - even if it is nonstick, it's easier. Lightly beat eggs with fork or hand whisk. Add flour, milk, salt and whisk lightly - do not try to get out all of the lumps - doing this would cause over beating and tough popovers. Ladle half the batter into muffin pan. Divide the cheese evenly and sprinkle over batter. Ladle the rest of the batter on top. Cups should be 1/2 - 2/3 full. Put into preheated 450F (230C) oven for 25 minutes. Turn temperature down to 350F (175C) and continue baking 15 minutes longer, until nicely browned.